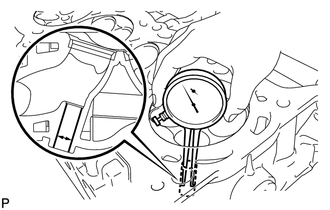 (a) Heat the cylinder head to approximately 80 to 100°C (176 to 212°F). 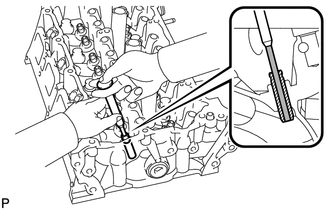 (c) Using SST and a hammer, tap out the valve guide bush. 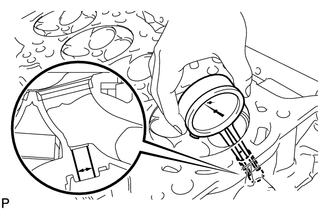 (d) Using a caliper gauge, measure the bush bore diameter of the cylinder head. If the bush bore diameter of the cylinder head is between 10.285 and 10.306 mm (0.405 and 0.406 in. ), proceed to the next step. (e) Select a new guide bush (STD or O/S 0.05), and measure its diameter. (f) Machine the bush bore of the cylinder head to the diameter of the selected guide bush. (g) Heat the cylinder head to approximately 80 to 100°C (176 to 212°F). 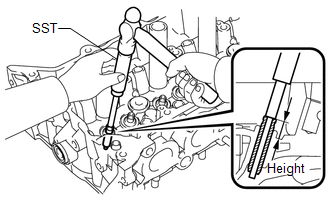 (h) Using SST and a hammer, tap in the selected guide bush to the standard protrusion height. 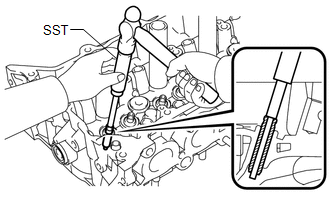 (i) Using a sharp 5.5 mm reamer, ream the guide bush to obtain the standard oil clearance between the guide bush and valve stem. 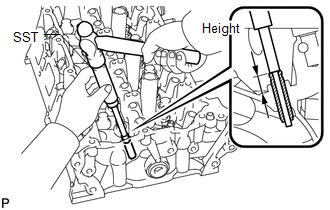 If the bush diameter of the cylinder head is between 10.285 and 10.306 mm (0.405 and 0.406 in. ), proceed to the next step. 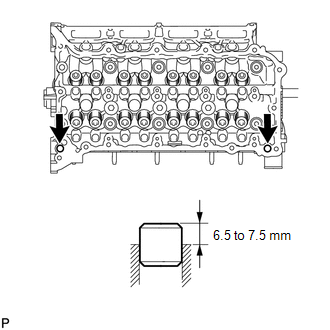 If the bush bore diameter of the cylinder head is 10.356 mm (0.408 in.) 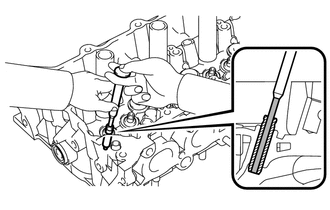 or more, replace the cylinder head. (a) Remove the ring pins. 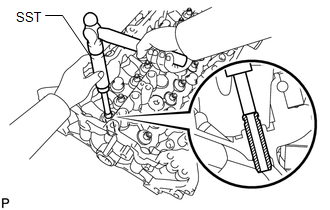 (b) Using a plastic-faced hammer, tap in new ring pins to the cylinder head.